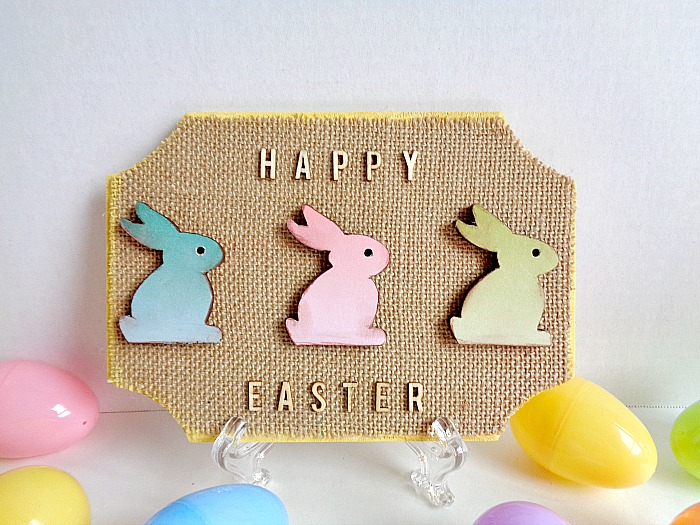 Today I another Easter inspired DIY for you guys to try! As you can tell by the title, today's DIY lights up! In the past I've done a few lighting projects here on the blog, but nothing like what I'll be showing you today. In today's project, I will be using Chibitronics Chibi Lights LED Circuit Stickers! Now if you have never heard of Chibitonics, they are a company that makes LED Circuit Stickers. These LED Circuit stickers are designed to be used in a variety of projects ranging from cards to home décor. The cool thing about them is that you get to create the circuit, which makes the light turn on. To create the circuit you simply use the items in the kit that are given to you and decided how many lights you want to use in your project. Then once you have your lights all connected, you can begin crafting over the top of them. If you think this whole idea sounds a little complicated and crazy, it's not. There is a book that comes with the kit which explains everything you need to know about using the LED Circuit Stickers. Now today's project is part of my collaboration with Xyron since I'm a member of their design team! This means you will be seeing a Xyron machine in action! For this particular project, I will be showcasing two Xyron products. Those two products being Xyron® 9” Creative Station and Xyron® Tape Runner. I talked in detail about Xyron's Creative Stations in this post, so if you want to learn more I would definitely check it out. However, I've never really touched upon there Tape Runner. Xyron's Tape Runner is a bit different than other adhesives because it has a dot-like matrix pattern when being applied to a project. This dot-like matrix pattern is important because it allows you to avoid ''stringing'' when applying the adhesive to your projects. All in all, its a pretty cool Tape Runner that is very inexpensive and has a strong adhesive bond! With all my rambling out of the way, let's hop into the DIY (see what I did there)! 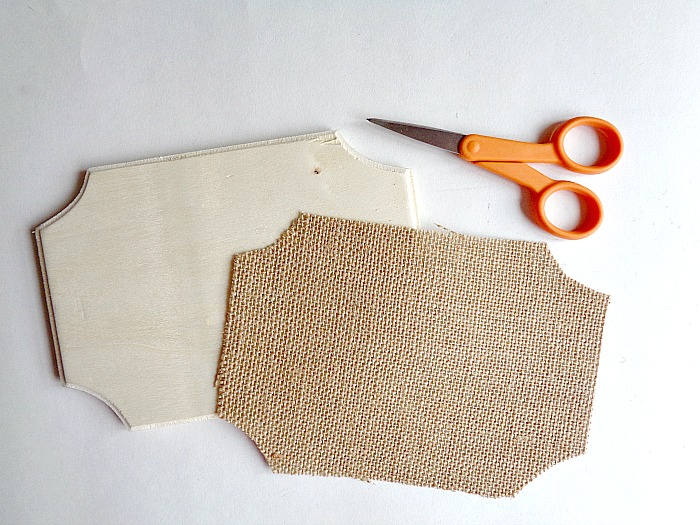 Step 1: Cut out a piece of burlap that will cover the top of your wooden plaque. 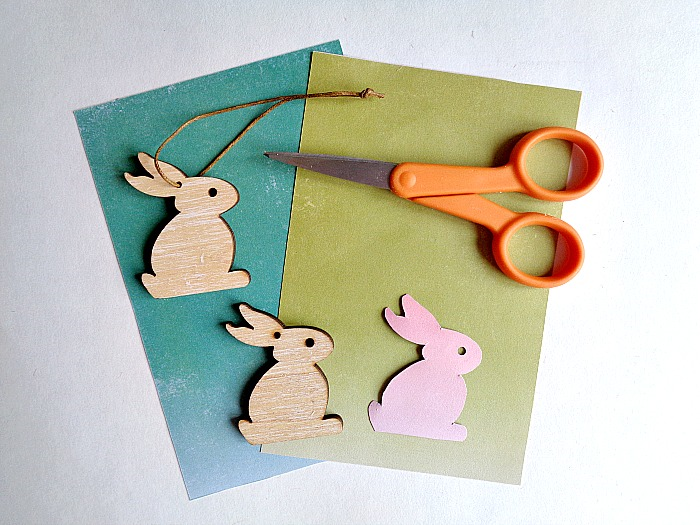 Step 2: Cut the cord off of your wooden bunny ornaments. Then grab your scrapbooking paper and trace around each bunny using your pencil. Finally, cut out each bunny that you traced. Step 3: Grab your piece of burlap and your paper bunnies and run them both through your Xyron 9'' Creation Station. 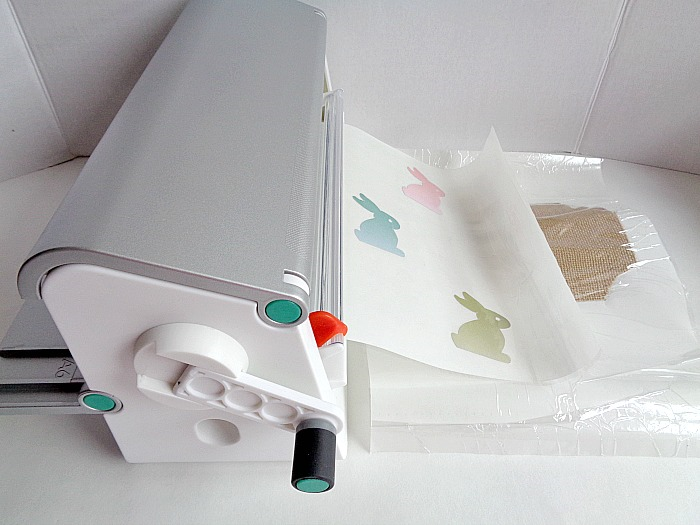 Step 4: Now take your paper bunnies and rub the top of the sticker paper. 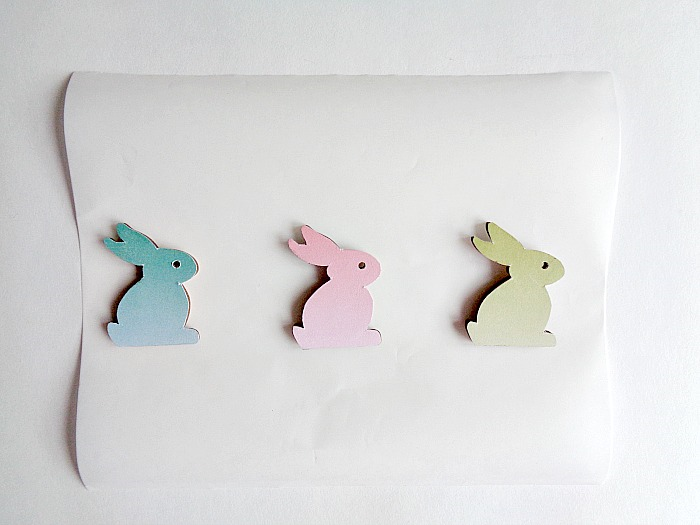 Then peel the paper bunnies off the sticker paper and adhere them to your wooden bunny ornaments. 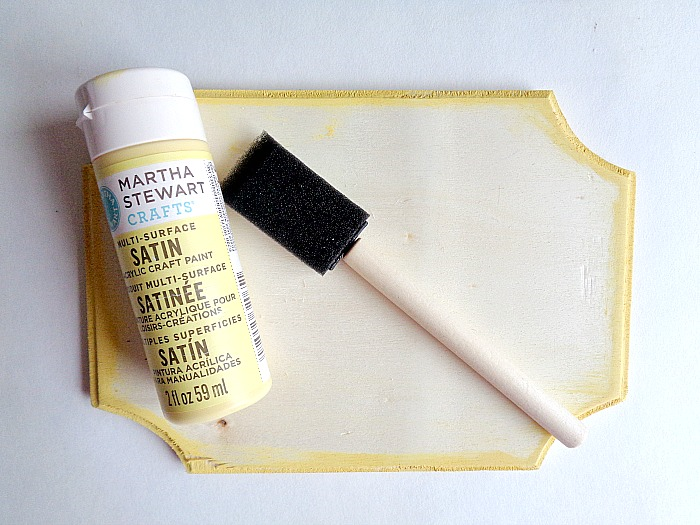 Step 5: Grab your wooden plaque and paint only the edges. Once you're happy with how it looks, set it aside to dry. 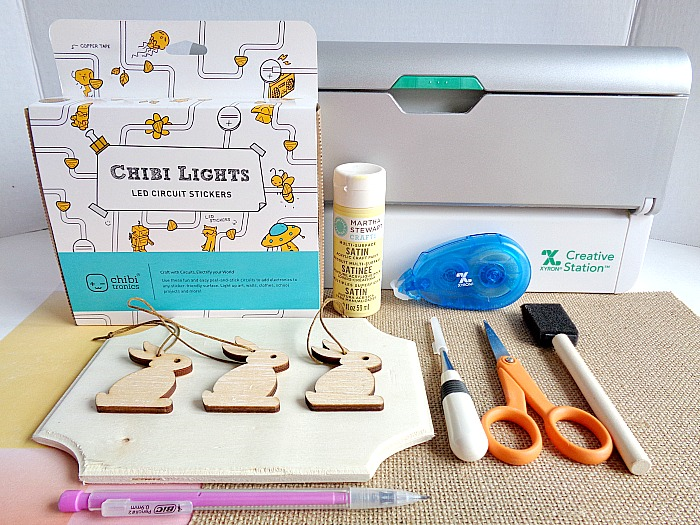 Step 6: Grab your Chibitronics Starter Kit and take out your copper tape. You will want to lay down two pieces of copper tape which are parallel to each other. However, make sure that your copper tape runs to the back of your wooden plaque on one side. 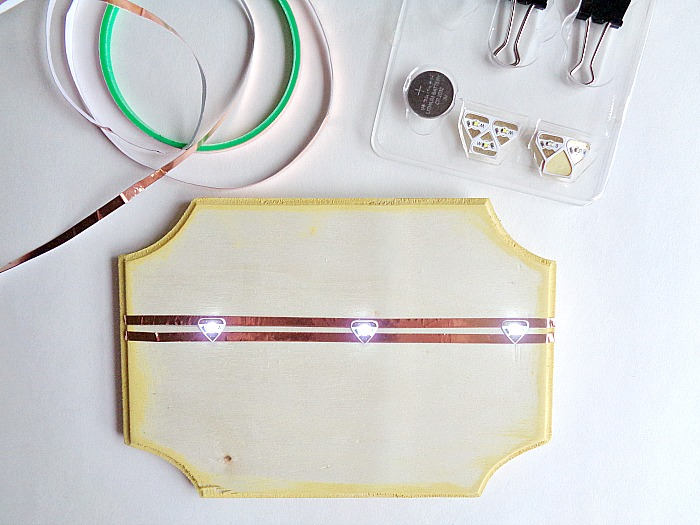 Then lay down your led stickers onto the copper tape, making sure that they are evenly spaced. Finally, create a little battery holder by following the kit's instructions and add your battery. Step 7: Take your burlap and rub the top of the sticker paper. Then peel the burlap off the sticker paper and lightly apply it to your wooden plaque (don't press it down yet). While your lights are on, make little marks where your lights show up on your burlap. 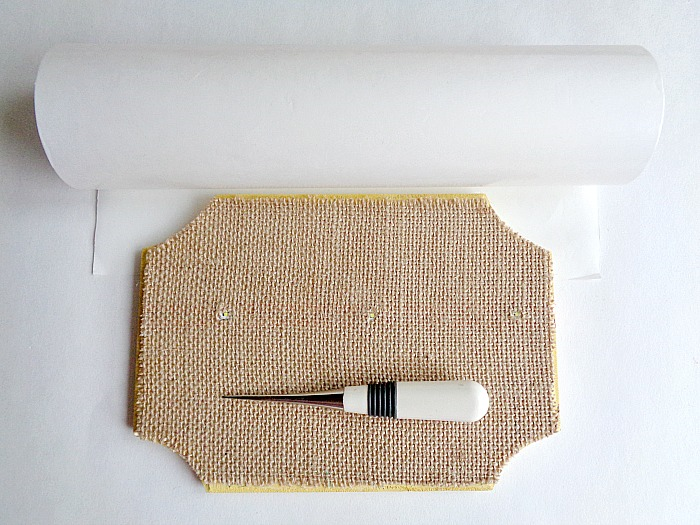 Then gently peel your burlap up and poke holes (using your awl) where your marks are. Finally, press your burlap back down onto your wooden plaque. 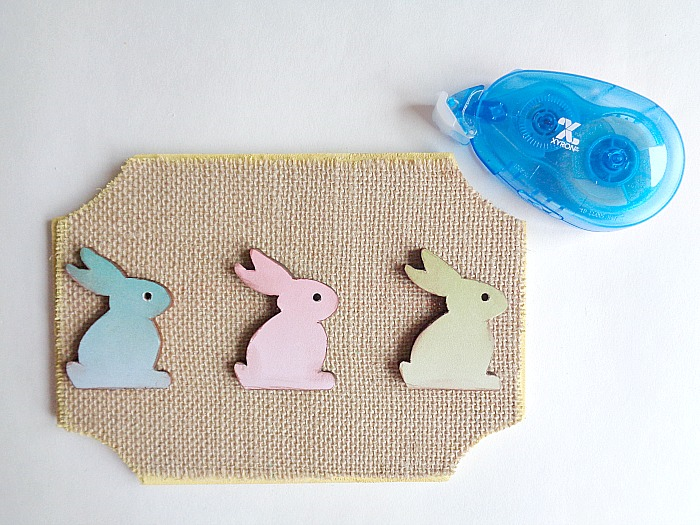 Step 8: Flip each of your wooden bunnies over and apply some Xyron adhesive (using the Xyron Tape Runner) to their backs. Then (while the lights are on) line up each bunny's eye with the lights and press each bunny into place. Side Note: You may have noticed that my bunnies look a little bit darker compared to step 4. This is because I took a brown marker and colored the edges of the paper on my wooden bunnies, to give them a more ''distressed'' look. 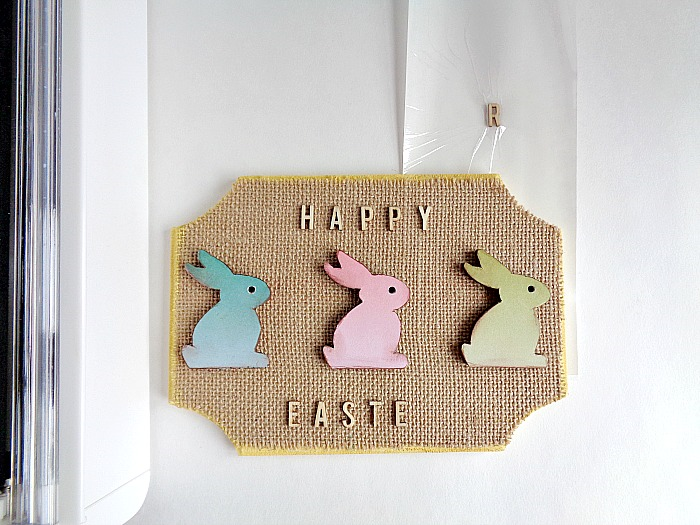 Step 9: Grab your wooden veneer letters and spell out ''Happy Easter''. Once you have the phrases laid out, take each letter and slide it through your Xyron Creative Station. In the above photo, you will see how I ran the ''R'' in Easter, through the sticker maker. Then rub the top of the sticker paper and peel off each letter. 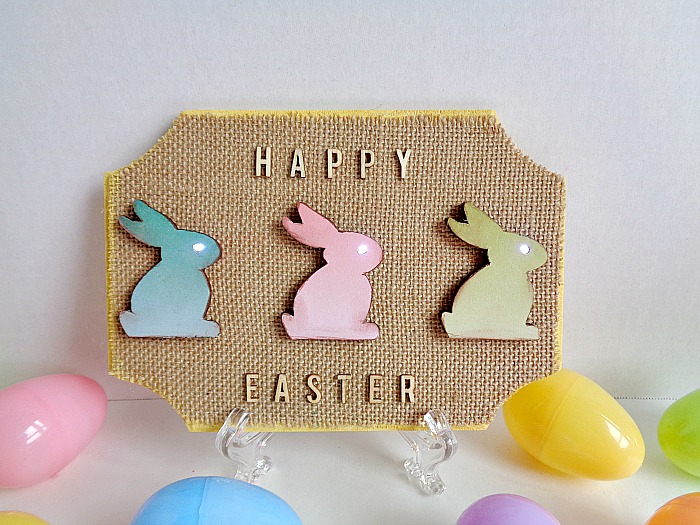 Finally, add each letter to your wooden plaque by putting ''Happy'' at the top and ''Easter'' at the bottom. Now this step is completely optional, but I thought it added a nice little touch to my sign. Once you're done adding your letters, you're ready to display your new light up sign! 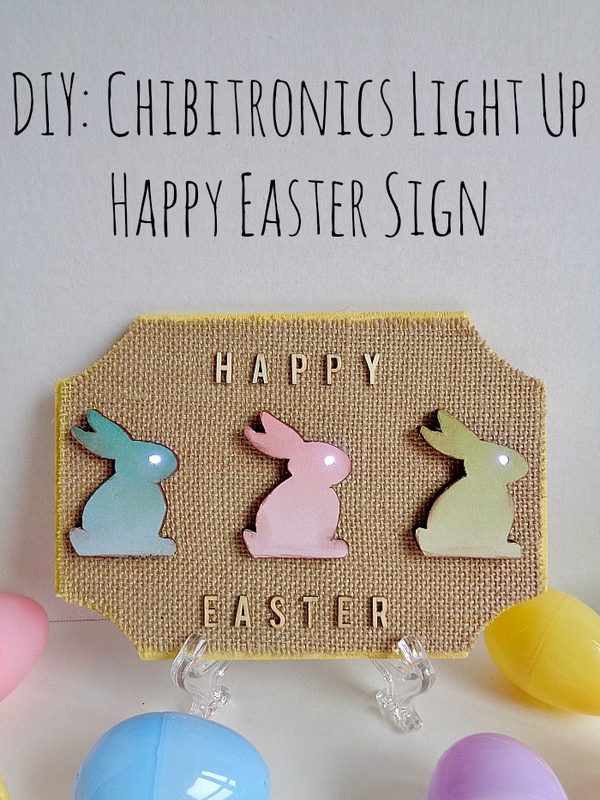 Now Even though I created a sign for Easter, you could use this DIY as a guide when creating other lighting projects if you're using Chibitronics LED Circuit Stickers! For example, I think the look of three lights in a straight row on a card and then crafting over the top of it, would be cute. If you guys would like to see a full review on the Chibitronics Chibi Lights LED Circuit Stickers, leave a comment below and I will be happy to write one. Also, head on over to the Chibitronics blog where they are featuring Xyron projects from their Design Team all week long! As always to follow along with all the Xyron fun, don't forget to like them on Facebook and to follow their Pinterest page for more project inspiration. So what do you think? Have you ever heard of Chribitronics LED Circuit Stickers?